ACS 2009, The Tour, The Conference, The Competition, The Fun! 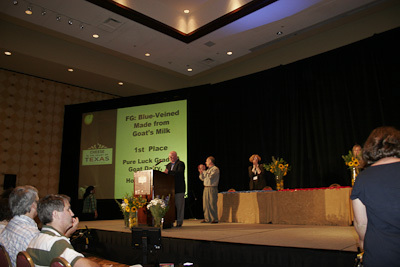 The American Cheese Society 2009 conference is now over, but it will be remembered around here forever! 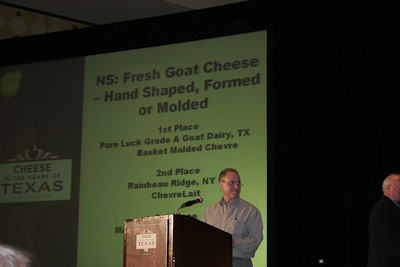 The American Cheese Society conference started long before Wednesday morning for us at Pure Luck. We were hard at work preparing to be hosts for our friends and peers. Amelia was speaking with the media during her short breaks from cheesemaking. Among those were The Chronicle for their article on The American Cheese Society and The Austin American Statesman’s article “Masters of Cheese”. On Wednesday, as we were waiting for the tour bus of cheesemakers, cheesemongers, and foodies to arrive, some of us frantically made last minute polishing touches to the dairy. Meanwhile, Amelia was with Julie Moody of KUT, the local public radio station giving an interview. Then it happened, the bus pulled up and we got to work. I use the term “work” lightly because this tour was a blast! Gitana showed some of the group around the pasture to meet the girls, Amelia showed some others how we make our cheese, and I had the wonderful job of showing off our humble milking parlor and demonstrating the milking process. Many of the group decided to try their hand at milking a goat on their own! After the main tour we all enjoyed some cheese, ice cold water from Richard’s Rainwater, and local Texas brews from Real Ale. Thank you everyone for choosing to come out, and thank you to our friends and family for helping us make this tour such a success! Later on Wednesday night was Meet the Cheesemaker. I went and setup our table with some Hopelessly Bleu, Feta with olive oil and fresh rosemary, and some Basket Molded Chevre. It was a lot of fun to chat with everyone on a level that was a little less hectic than the Festival of Cheese. Over the next couple of days we ate cheese… some more cheese… and a little more cheese. I scratched the surface on the knowledge out there about cheese cultures, learned a bit on raw milk cheeses, milk characteristics, and mingled with my friends and soon to be friends in the cheese world. Friday night was the awards ceremony that everyone had been anxiously waiting for. 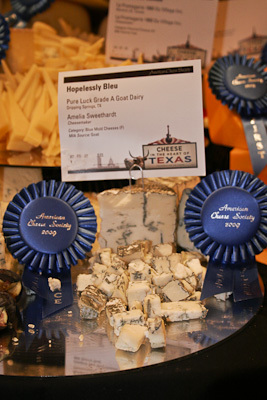 Pure Luck’s Hopelessly Bleu won 1st in it’s category, the Basket Molded Chevre also won a 1st in it’s category, and the Feta won a 3rd! We were overjoyed! Amelia was positively glowing. Amelia picks up the Blue for the Bleu! 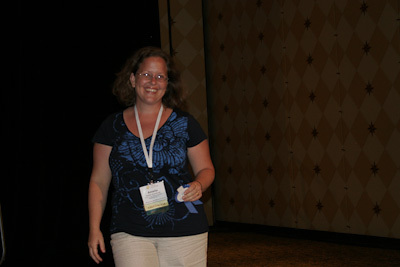 The next day, Amelia was on the panel for the Texas Terroir session. 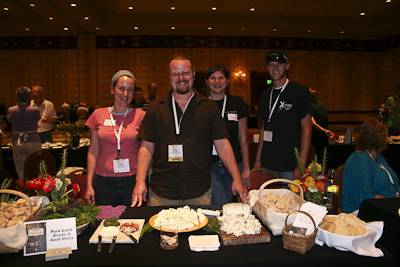 This session was a pairing and information session on Texas cheeses and beers. Amelia did such a wonderful job, and everyone had a great time! Austin’s own food blog Austin Farm to Table did a complete writeup on the Texas Terroir session. On the The Festival of Cheese! This event is beyond amazing! Imagine standing in a room with about 1300 cheeses all presented and prepared for you to eat. That’s right, an entire grand ballroom in the Hilton with almost every square foot crammed with cheese! It took a little wandering around but I finally found some of ours. While enjoying the cheeses with our friends and family, I got a chance to share some of my story with Rachel Silverman who writes for The Wall Street Journal’s site Speakeasy. But wait, there’s more! 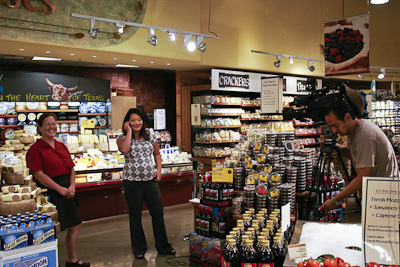 The day after our adventure in cheese, Amelia went out to the Whole Foods flagship store for an interview with News 8 Austin! Now the shoutouts: Thank you so much to our friends Cathy Strange, Sara Hill, Sheana Davis, Paula Lambert, Chip McElroy, Tim Schwartz, Cathy Cochran-Lewis, Stuart Veldhuizen, Des Dunn, Anne Jones, Greg Flores, Gordon Edgar, Hope, Claire, Ryan, Gitana, Peter, the Dripping Springs Babbler, Mimi Pam, and many others I probably forgot to mention that helped and supported us through this convention! Thank you! Thank you! Thank you! One last note. 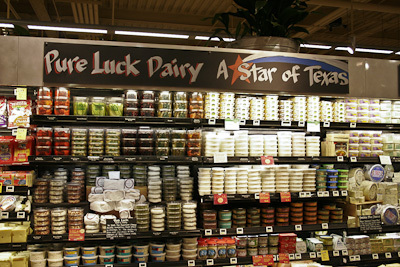 Pure Luck is now on Facebook, so please become a fan of Pure Luck Farm and Dairy on Facebook! Hey guys, congratulations, the spirit of Pure Luck keeps going on and on and on….